Delhi is warming up a bit faster than I expected this year, so it's time to update a post we ran a few months backs on the wonders of evaporative cooling. Sometimes the best greentech is low-tech! We've written before about the wonders of ceiling fans, hot water bottles, bicycles and animal-powered machines. Today, we focus on evaporative cooling. Instead of giving huge subsidies foreign nuclear power companies, why not figure out how to export some of these low-tech-greentech products to the US? We won't have to ask the US to protect our companies from huge lawsuits, because this stuff is safe and simple. And I'll bet we make it better and cheaper than anyone else in the world. Coolers are popular because they use 80 percent less electricity than an AC. Back when my family used an AC, we consumed 600-750 units (kwh) of electricity each month between April and August. Since we replaced our AC's with fans and water coolers three years ago, we have consumed an average of 300 units during those months. Now that's savings you can take to the bank! Of course during the wet months, a cooler is basically just a big fan, and we sweat a lot--I won't lie to you about that. But in Delhi, coolers work wonderfully well in April, May and at least part of June. Coolers have another advantage from an environmental point of view: they contain no environmentally harmful gases, no radioactive materials. Here you will find a wealth of information on this kind of cooling, including some very impressive mathematical equations relating to relative humidity. Please don't ask me to explain those, because I just can't do it, except to say what everyone with a cooler knows: the drier the air, the cooler the cooler! Water coolers are based on technology that is thousands of years old, and the Americans have used them for over a hundred years, especially in the Southwes t. However, coolers are not widely used in many other parts of the US that could benefit from them. The same is true for Europe. As the earth warms, this market will increase. We need to be there, making our share of the profits. 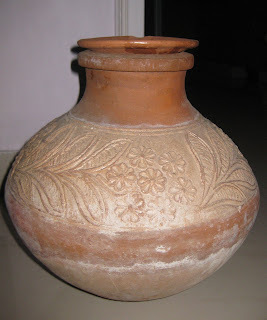 While we are on the topic of evaporative cooling, it would be wrong to forget the humble matka. Because the clay is porous, matka's use the power of evaporation to cool your water without refrigeration, which means less opening and shutting of the fridge door. Also, they are not lined with unhealthy plastic, and they look nice, too! These would surely be a best-seller in the US, if given half a chance--retro green low-tech. Nathu Sweets in Bengali Market serves up their fabulous lassi in equally fabulous tall earthen 'kulhad's. These are normally disposed off after every use, but I brought mine home. Not just are they excellent containers for water (unlike the usual lightweight kulhads, these are much sturdier in construct) which keep each individual measure of water cool - they also make great little pots for planting herbs. few things as pleasing to the senses - of smell, and touch - as earthen pots. Sounds like just the excuse I need to go get a fabulous lassi! Nice to have you stop by. Long ago somewhere, I saw ice-cream being served in coconut shells which were polished up a bit to remove the fibre. Looked great too, like the matkas and kulhads. Great article. I agree with the statement that the US could take a note, of this "retro-technology" as you put it. 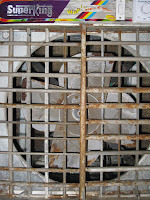 The majority of household electrical spending is due to residential air conditioners. Something like this could help reduce that, even just a bit if used together to lower the room temperature.